Maureen Taylor, well known for her books and articles about every aspect of "old photos," is wrapping up a project and invites all to contribute before the deadline of March 15, 2008. She wants photos of "America's Revolutionary War Generation." These would be folks born in the 1760s or 1770s who were still alive when photography was developed. "Anyone who was a young adult during the American Revolution would have been at least 80 years old by the advent of photography." And YOU might have one of those pictures she seeks. If so, send Maureen an email at mtaylor@taylorandstrong.com with this in the subject line: Revolutionary War Generation. She will then email back to you instructions on how to send your photograph to her. These photos are soon to be published in a book by Kent State University Press. The book will tell the story of the Revolution through pictures of a variety of its participants: veterans, loyalists, and wives. Look over your old family photos and see if you have a candidate to help Maureen with her project. Sounds like it's surely a worthwhile one. The February Board and General Meeting for EWGS has been cancelled due to extreme snow and road conditions. The program by Pat Bayonne-Johnson is rescheduled for November 2008 - as that date was still open. So stay warm and safe and we will see you all on March 1st. Are you a descendant of the famous Battle of Culloden which took place in Scotland in 1746? If so, you'll want to read this post by Tim Agazio at his genealogy blog, Genealogy Reviews Online. Seems that the National Trust for Scotland wants children throughout the world to study their family trees in hopes of finding descendants from both sides of the battle to help with the grand opening of a new visitor's center. Doesn't that sound like an interesting way to get your children and grandchildren involved in genealogy? If you are researching Michigan ancestors, you may be interested in this site, Michigan Biographical Index. "This is a cumulative full-name index merging many Michigan publications and manuscripts," says the introduction. You search for an ancestor's name, and if found, you will be given information about the publication his (or her) biography is printed in. Some of these sources may be available online, for instance, at the Michigan County Histories site or on Michigan GenWeb or GenNet sites. You can Google the name of the publication; in fact, it may even be available at Google Book Search! Don't forget the genealogy room at the Downtown Public Library, or try InterLibrary Loan to obtain a desired book. Many of these can also be purchased new or used at online bookstores. Now go out and find your ancestors! I'm just back from a wonderful learning-intensive week at the UGA (Utah Genealogical Society) sponsored Salt Lake Institute of Genealogy. This was truly a college-course week of learning. There were ten tracks from Welsh Research, to Using Digital Media, to Advanced Problem Solving, to French Research to U.S. Methods and Research........... and I attended the Western States Research track. I spent Monday-Friday, 8:30-3:30, in a class learning almost more than anybody needs to know (just kidding) about research in the western United States. One over-arching thing I learned, we all learned, was this: You CANNOT expect new answers or new findings when you keep looking for the same things in the same old places in the same old way. Attending Institute was a way to really broaden my genealogical researching horizon. Institute is always held in early January at the Radisson Hotel (one block from the dear-old Plaza where I stayed) and costs about $300 just for the course. For more information, stay tuned to the UGA website. 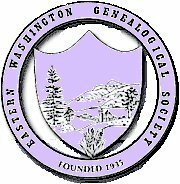 And keep in mind our old Washington State Genealogical Society maxim: You won't know if you don't go." Henk van Kampen over at Trace Your Dutch Roots has started a new series of posts on online Dutch genealogy resources. Although for years I've been using many of the websites that Henk will probably be featuring, I am looking forward to his series immensely. Having the perspective of being a native Nederlander, he has insight to resources that might otherwise be missed by those of us descended from Dutch immigrants. Every time he posts something new on his blog, I learn a little more. I'm sure he'll also feature sites and resources I have never heard of before. If you have Dutch roots, you won't want to miss a single article! A reminder to all that our January meeting is our annual luncheon. This year it will be at the Mukogawa Commons at 12 Noon, 5 January 2008. In addition to the program "They Called Them the Mercer Girls" by Peri Lane Muhich, we will be honoring our Past Presidents and Distinguished Service Members. Additionally Doris Woodward will be announcing the winners of this year's writing contest. Registration form is in your December Bulletin or can be downloaded from the EWGS website.